High-Production 1/2 or M12 Max Capacity ER16 Precision Holding with 2500 RPM Max. 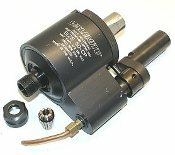 Includes ER-16 1/4 Collet and Closing Nut. Shank is 1 inch. Overall In Excellent Condition - very little use, well maintained.